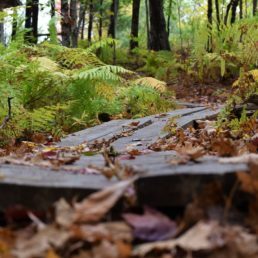 The Intervale Preserve in New Gloucester, owned and managed by the Royal River Conservation Trust, can be accessed by two separate trailheads and primitive hand-carry boat access points at 642 Intervale Road and 520 Penney Road. The Preserve is popular for its short loop trail, ecology & habitat, Royal River access, snowmobile access, and hunting access. The Intervale (the river valley between hills) provides some of the Royal River watershed’s most valuable habitat for migratory birds, waterfowl, and game birds. The 100-acre Preserve is part of the Intervale’s larger system of floodplain wetlands and marshes covering 1215 acres, surrounding by scenic farms and working forests. 642 Intervale Road: This flat half-mile loop trail starts at a safe parking area on a wide road shoulder; parking is often plowed in the winter. The trail provides gentle walking with short plank bridges avoiding wet areas. The forested trail provides views onto the river’s fresh water flood plain marsh and vernal pools, a popular destination for birders and sports. The marsh is an outstanding vantage point for observing migrating birds especially in May of each year. The trail includes one bench for resting midway, a picnic table near the trailhead, and a primitive hand-carry boat access point. – From the South: From Pineland Farms, follow Route 231 North/Intervale Road for 4.4 miles. The parking lot and trailhead will be on your right, 1/4 mile past the intersection with Woodman Road. – From the North/West: From Cobb’s Bridge Road or New Gloucester Village, take Route 231 South/Intervale Road for 1 mile. The trailhead will be on your left. Ample parking is available on the wide grassy shoulder of the road. The hiking trail begins at kiosk with blue signage on the side of the road near the railroad tracks. 520 Penney Road: The Penney Road trailhead primarily serves as a primitive boat access point, a snowmobile trail, and hunting access. Parking is on the road shoulder or on the steep rutted woods road (snowmobile trail.) Powerline construction in 2020 or later will disrupt this access point. – From New Gloucester Village: Head Southeast on Route 231 South for 3.9 miles. Take a right onto Penney Road and continue 0.8 mile. The parking area will be on your right. – From North Yarmouth Village: Head North on Route 231 N for 5.6 miles. Take a left onto Penney Road and continue 0.8 mile. The parking area will be on your right. Water Access Parcels: Some parcels of the Intervale Preserve are accessible only by canoe. Please refer to maps. Downriver access from Penney Road (paddle upriver and back) is best. For details see the Royal River Water Trail description of this section of river. The Preserve is open for hiking, hunting and snowmobiling. Bikes are not allowed due to trail construction standards. Public use of rail lines is always illegal and always dangerous. Both the Intervale Road and Penney Road parcels support snowmobile connecting trails. CMP powerline construction rights will be used on this trail corridor in 2020 or later, disrupting traffic at Penney Road. Dogs are welcome, but on leash or voice control, with strict attention to pet waste removal. Safe and responsible hunting on the preserve is encouraged. We promote safe hunting experiences and protect deer by educating users of the hiking trail and their dogs to be respectful of hunters. As a courtesy, please call RRCT to inform us if you plan any trapping on the parcel. Hikers should always wear orange during all hunting seasons, on all hikes. Tenting and camping is allowed well-away from trailheads or neighbors. There are no good sources of water on the preserve, and no privies. Give us a call to let us know of your plans, and plan on strict adherence to “leave no trace” principles. Smoking is prohibited at all RRCT preserves. RAILROAD TRESPASS: Public use of rail lines is always illegal and always dangerous. POWERLINE CONSTRUCTION: Powerline reconstruction at Penney Road is expected in 2020 or later. Please look for updates and information and respect any construction postings. SAFE HUNTING: Safe and responsible hunting on the Preserve is encouraged. We promote safe hunting experiences and protect deer by educating users of the hiking trail and their dogs to be respectful of hunters and deer during season, including winter deer yard season. Hikers should always wear orange during all hunting seasons, on all hikes. RESPONSIBLE PET OWNERSHIP: Our preserves provide valuable access for pets and pet owners. We are always concerned by pet waste left behind, and by dogs not controlled by their owners. Please help us create a culture of respect and responsibility. NEIGHBORS’ POSTINGS: Please respect various postings on private abutting land; many of these postings aim to protect nearby farm animals from dogs or hunters. The bird-rich area of New Gloucester’s Intervale is renowned for Sandhill Cranes, migrant shorebirds, and more. For more information on birding in the Intervale visit: Best Birding in the Royal River watershed. The Intervale Preserve provides boat access at two locations, at 642 Intervale Road (upriver northwest corner of bridge), and also at Penney Road’s Royal River crossing on the (upriver northeast corner of bridge). CMP powerline construction access rights will restrict parking and river access at Penney Road in 2020 or later. These access points allow for bank fishing and boat launching for paddling, fishing, and hunting by boat.The two boat access points create a short trip on their own, or starting points for longer trips; the stretch of river from Penney Road downstream to Wescustogo Park is a wonderful 8.1 mile high-water paddling trip. Landowner courtesies or steep scrambles are required for earlier take-out. More information on the Royal River Water Trail. This section of the river may be only be suitable for informed boaters due to variable water levels and frequent trees or beaver dams blocking passage. Boat access points are steep muddy banks. When paddling, please respect private landowner signage along the river often prohibiting fiddlehead harvest and hunting on private land. The 100 acres of land under RRCT conservation ownership along with RRCT conservation easements protect 2 shoreline miles of the mainstem of the Royal River in the Intervale. Nearby conservation efforts of state agencies mean that a total of 250 acres and 3 shoreline miles of the Royal River are now protected in the Intervale. Comprised largely of lush meandering oxbows, the Intervale provides some of the Royal River watershed’s most valuable habitat supporting migratory birds, waterfowl, and game birds. In total, the Intervale comprises roughly 1215 acres of high value wetlands surrounded by scenic and productive farms and forests. 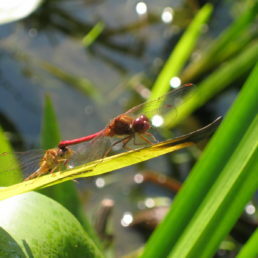 Owned by the Royal River Conservation Trust, the initial parcel of the Preserve was donated for conservation by Jan Erikson and Nan Butterfield in 1991. Initial trail work and kiosk installation funded by L.L. Bean and others was completed in 2011. Sculptures were installed in October, 2013. In late 2017, the Preserve was significantly expanded by three separate transactions, expanding the entire preserve from 30 acres to 100 non-contiguous acres, and expanding conserved shoreline miles of the Royal River mainstem from 0.3 shoreline miles to two shoreline miles. The newly conserved land supports habitat and water quality, fishing access, birding access, a new paddling access point at Penney Road, a local snowmobile trail connection, access for fiddleheads, bird-hunting, trapping, and other sports. 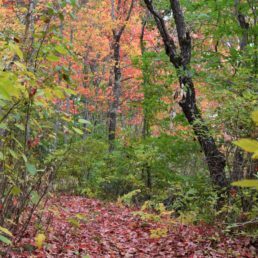 The various transactions in late 2017 were funded by private funders, landowner donations, the Maine Outdoor Heritage Fund and RRCT’s Land Acquisition Reserve Fund. The transactions involved acquisition, donation of land, and partnerships with the Town of New Gloucester selectmen and Central Maine Power. In 2018 the Preserve was expanded again by a donation of two small parcels by neighbor Field Rider. Nearby farmland conservation projects in 2017 and 2018 (Waterhouse Farm and Brookings Farm) also provide important conservation landscape context. Today (2019) we are working with three landowners for additional expansions of conservation protections in the Intervale. The Royal Treasures activity allows kids of all ages to find unique pieces of sculpture installed in special places within the Preserve. Each sculpture helps interpret the ecology, history, and natural dynamics of the preserve.